In recent days, hundreds of thousands of Snapchat images stored on a third party website were leaked online by internet hackers. Many of these images contained content that users most definitely did not intend to be released publicly. Some are also believed to show users under the age of 16. The leak is linked to a similar hack that occurred in August, in which naked photos of high profile celebrities were released. The controversy once again ignites the debate concerning internet privacy, while also potentially severely damaging the Snapchat brand, perhaps irrevocably. It is especially detrimental as one major draw of the app is that the photos are only viewable for a maximum of ten seconds before ‘disappearing’. If this concept is no longer viable, what does it mean for the future of the app? YouGov’s BrandIndex tool elucidates this problem clearly, with our metrics showing the public reaction to the news. 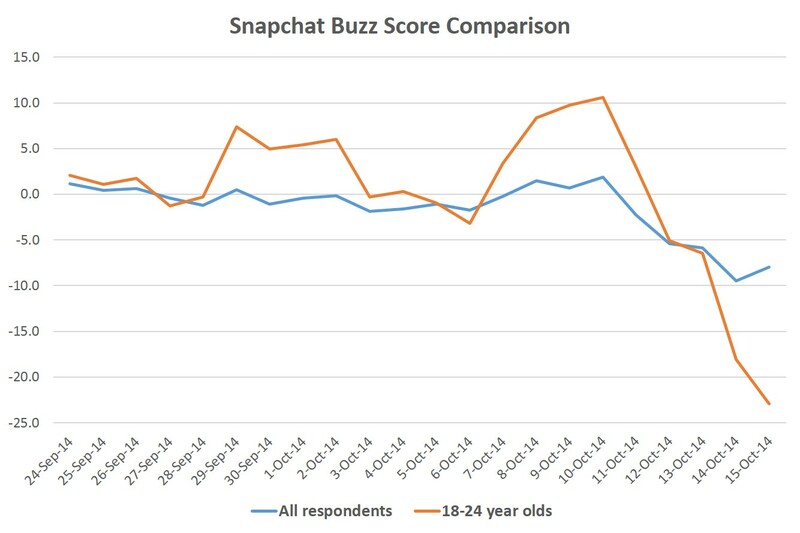 The Buzz metric (which asks whether a respondent has heard something positive or negative about a brand in the last two weeks), is especially damning for Snapchat. Their buzz score in the UK has plummeted since news of the leak surfaced, decreasing from +1.2 to -9.5 at its lowest point among all respondents. In a key demographic for the app, 18-34 year olds, it’s an even more serious story; down 25 percentage points to -22.9. YouGov research carried out in March of this year, revealed that one in three (29%) of 18-24 year olds and 25-39 year olds (31%) had taken a photo of themselves naked. Should the public therefore show more discretion and be more aware of the risks of engaging in such behaviour, or is it the responsibility of the apps to assure security? It is clear that Snapchat needs to identify the reasons for the leak, act upon it and make sure that it reassures users that such an event will not happen again. In an era in which app users can move from one service to another very quickly, falling out of favour with users could be terminal to future growth and revenue. Whether its popularity among younger users in particular will endure will be crucial in the months ahead.